Use the form below to contact accommodation Astina Central directly. 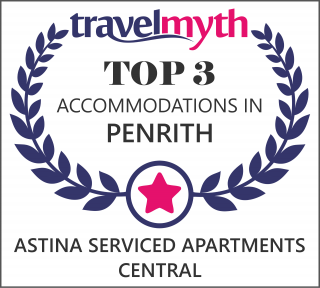 Astina Central Apartments feature modern 1, 2 and deluxe 3 bedroom apartments. All bedrooms include an en-suite. Only 2 minutes walk from Nepean Hospital. These apartments contain 1, 2 or 3 bedrooms. 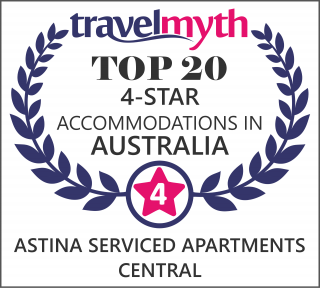 Astina Central Apartments have staff onsite daily, however do not have a reception style counter. We ask that guests could please give us 30 minutes notice prior to arrival so we can ensure every guest is met with our personalized service from our management team. All below pricing is per night. Standard 1 bedroom apartment: $189* for up to two guests. The apartment comfortably sleeps two guests. Max two guests. Standard 2 bedroom apartment: $219* for up to two guests. $45 for every additional guest. The apartment comfortably sleeps 4 guests however additional beds can be added. Max 6 guests. Deluxe 3 bedroom apartment: $299* for up to three guests. $45 for every additional guest. The apartment comfortably sleeps 6 guests however additional beds can be added. Max 8 guests. Rates are subject to change. Astina reserves the right to change the nightly rate at any given time. Please use the above information as a guide only. Please click the "book now" button to see the actual nightly rate for your selected date period. This floor plan depicts the most typical and common layout for this apartment type. As the hotel is a unique building not all apartments are exactly the same size, shape or layout and we do not have floor plans for each individual apartment. We are unable to guarantee any reservation to a specific apartment. This floor plan is offered as an indicative guide only. Guaranteed to enjoy your stay with our excellent customer ratings. Wet 'n' Wild Only 20 minutes drive! Enjoy free high speed wireless internet when you stay with us. Free pick up / drop off on check-in or check-out from Penrith or Kingswood station. * Minimum 2 night stay required. When booking Deluxe 3 bedroom apt, available on 1 night stay. © astina.com.au 2014. All rights reserved.